Soapwort is a wide-spread perennial plant; the finger-thick creeping rootstock produces a reddish, branching stem, which grows from 1-3 feet high and bears opposite, ovate, pointed leaves whose bases clasp the stem. Flat-topped, corymbed clusters of pink, sometimes white or purple, flowers bloom from June to August. 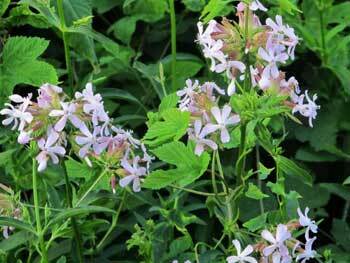 Soapwort tolerates poor soil as long as it is well-drained, and full sun or light shade. Grows in waste places and along roadsides and railroad embankments in eastern North America, Asia, and Europe. A rugged perennial very common along roadsides and near old homesites. It was brought to America by early colonists. The fresh leaves, stems and flowers produce a considerable amount off saponin and cleans as well as leaves a beautiful luster to fabrics. According to an English source, soapwort has been used to clean “filthy”, colorless, decrepit brocade curtains more than 200 years old. The antique curtains were not only cleaned but the original color and luster restored. Bunches of fresh soapwort were put in a muslin bag and boiled in a cauldron until it produced a foaming brown liquid similar to beer. When luke-warm the bag of herbs was removed and liquid squeezed out. The curtains were gently dunked in the saponin liquid. They probably were allowed to steep to loosen embedded dirt. The curtains were then removed and dunked again in several changes of rain water. Never use chemically treated water for silks or fragile materials. The author of this information believed soapwort was safe for washing antique tapestries and silks. A decoction is used as an expectorant for respiratory congestion. Has been used for gout; externally as a wash or fomentation for dermatitis, itching skin, furuncles, and tumors. Soapwort has a mild purgative action. Poulticed on acne, eczema, psoriasis, poison-ivy rash, cuts, bruises, helps expel kidney stones, and increases urinary output. Root tea used for lung disease, asthma, gall disease, and jaundice. Decoction: boil 1 to 2 tbsp. dried root in 1 cup water. Take 1 tbsp. at a time. Soapwort is now believed to be toxic and is only used externally.